The many faces of the Doctor! 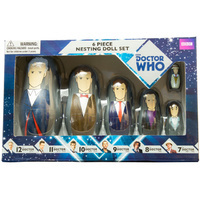 Taking regeneration to a whole new level is this Doctor Who 7th to 12th Nesting Doll Set. In this set you will receive 6 different Doctors. Peter Capaldi's version of the Doctor is the largest and each reduces in size down to the smallest (Sylvestor McCoy's version is the tiniest) and all are designed to stack inside each other. Now you can have all your favourite Doctors nearby, and even re-enact the regeneration process! Note - the War Doctor was too busy fighting the Time War to make it into this set. 7th Doctor - 3 cm in height. 1st - 6th Doctors also available as a Nesting Doll Set. 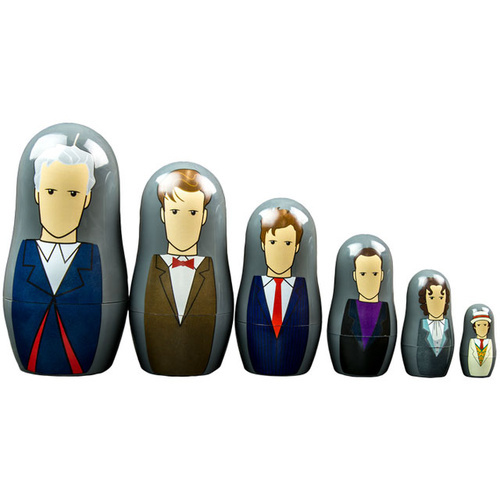 With my Dr Who nesting doll set, I can have all my Doctors on hand -it’s bigger on the inside. Cool! Not bad, smaler than I expected, I haven't taken it out the box though as its a Xmas present bought early.